Every year the Flightsim Expo has grown, from a humble 40 attendees (FlightSimCon) in 2013 to the extravaganza of this year's 2018 Expo in Las Vegas on June 9-10, 2018 at the Flamingo Las Vegas Hotel. Will I be there, well I doubt it as I live in Australia and I really don't think I would get a ESTA visa, In other words I am the sort of person Prez Donald Trump is trying to keep out. But I will keep trying, maybe next year... The thought though of Ben Supnic (Laminar Research) and Las Vegas in the one and same moment is got to be worth any trip to the Expo, Ben can create a massive party in a small time back street bar, so god knows what he will do with the resources available to him in Vegas... it doesn't even bear thinking about, but anything could be on the table post expo... as a side note, there is a notice for users down-under/Oceania for the "Ozflightexpo" in November in Sydney, there is a good chance I will be at that one. But it is the shear volume of users now that makes this SimExpo interesting, in the past then all these of these simulation flight conferences were totally and absolutely dominated by the FlightSim community, X-Plane was usually relegated to a small stand or a minor demonstration slot that got a few nosey punters at the back of the room... how things have changed. This year the Expo still has the FlightSim developers, so no change there, but their wares are now very much more focused on X-Plane and now even to the point that some of the FS punters are announcing their new product for X-Plane more than their traditional markets, I certainly doubt the group from Laminar Research will again be relegated to the back of the room status this year. There will be announcements for X-Plane, but that is not the really important aspect for X-Plane users at the expo. Every year these FlightSim conferences are usually used for the focus on the X-Plane future roadmap, where the simulator is going and what Laminar Research (LR) are focusing their (limited) resources on next. There is a lot of praise to be had in what Laminar have already delivered over the last few years, all that they have announced at FlightSimCon's in the past years they have always been implemented and Laminar have mostly delivered far more in features than they actually promised in the first place. There will always be the groans on that in say the ATC, or the weather, and now Vulcan and their current spiel of "when!" or "if ever". But I personally I have always kept the faith in that when Laminar does deliver a significant and usually for a very problematic key area of X-Plane, then their results or solutions are usually far more better and very elegant for the advancement of the simulator as a whole as like with the delivery of VR (Virtual Reality), so yes key areas are under development, and yes they will be delivered, so let's just "have a little more faith". So a lot is again going to be expected from Las Vegas 2018, but my guess is yes there will be some very nice surprises, but mostly the roadmap will be a more slimmed down but a more focused agenda than what has been presented in the FlightSimCon past. Certainly Vulcan, Metal and multithreading are always top of the wish list, so certainly expect a few notes and powerpoint slides on those items. The X-Plane ground effect is really the simulator's current and most prominent and annoying issue, expect a few notes on that or at least when a fix is coming, it was noted already to be included in the 11.30 beta, but we might find out actually "when" 11.30 might be put into beta. One note to make is the announcement (in a podcast) of the way Laminar Research are wanting to update certain aspects of the simulator, say in this case the engine performance. In the past LR set the performance settings in X-Plane and the developers then went to their own performance models and reset the aircraft engine performance to the new criteria, so far so good. But the problem with that approach was that as LR kept changing or fine tuning performance areas and in some cases even weekly or monthly, the developers just couldn't keep up with all the extensive changes, some tried but most failed (mostly in the jet engine performance) but many then just waited it all out until the changes were finally locked in (end of beta), but this took with X-Plane11 last year a full six months from the introduction of the new simulator version and that made a lot of the aircraft unflyable or just plain awful to fly during that waiting period, and think of the problem is then made worse by say the fleet of over now nearly 40 aircraft that are now produced by Carenado for X-Plane alone. The idea is that if Laminar reset or retune areas of the aircraft performance model, then globally the changes are then transferred to every X-Plane aircraft, so all are updated instantly, no lag and no huge task for the developers to edit every single aircraft to match the changes. It all sound's wonderful and simple, but from the start I had my doubt's, that in theory it would work, but again like with Carenado, you also have the 40 different flight models that are in fact very different from each other, a one set for all to me looks like it would cause more confusion than what it actually solves, again it will be interesting on if Laminar do address this item or bring up the subject at the FlightSim Expo. I would be really surprised if one of the areas that is not addressed or shown at Expo is the ATC. Tyler Young has been hacking away at this for quite a long time now and even asked us what we wanted from the ATC as well. The real problem is that a lot of users like me now use the WorldTraffic plugin extensively, so even if now Laminar do find a solution, then it still won't intergrate into the WT3 scenerio? I understand that Classic Jet Simulations is doing their own updated ATC system and I will admit the current built in version although very simplistic is not that half bad compared to the native ATC. A really interesting point is that if the native LR ATC is flexible enough, it could be used in or with WT3 as well? if the running traffic can give feedback to the native ATC then the idea gets interesting, even if you have to edit all those WT3 aircraft data files to make it all work. The built in ATC ground routes have come a very long way from the original layout, to the point that scenery developers are not using them effectively or setting the layouts up to the correct standards, as noted in last month's "Behind the Screen (April)" that they are certainly going to have to finally get their acts together and more so if the updated ATC is coming within the next batch of betas. One point about the Expo this year for Laminar is the fact that most of the roadmap they have promoted over the last few years, as like I have already noted have been covered and are now active, ATC and Vulcan (Metal) aside. So this year's Expo will give us a newer roadmap that the ones in past that mostly covered the known features, so it will give us a glimpse of what to expect from the rest of the X-Plane11 run, but don't expect a lot or a load of new features in the seminars, it will be more as a "steady as she goes" approach than the recent past's "all guns blazing" repertoire. But the importance of this Vegas Expo for Laminar is not to be underestimated either, this is certainly the most significant event that Laminar have ever rocked up to. In the past X-Plane was mostly a sideshow at these SimCon's, but in the last year and with the demise of Dovetail's Flight Sim World and now with the more mature X-Plane11 platform, then a significant crowd of FlightSim/P3D developers will be watching and inquiring on the X-Plane simulator's future roadmap, and that is all in their own interests and for their investment plans for the future. Many have already announced or released product for X-Plane, but aside from JustFlight, there still feels that there is still a reluctance to think of X-Plane as their main platform for the future in simulation. Laminar are certainly aware of this, so you may get a sort of Steve Jobs's... "and there is just one more thing" to highlight the platforms future direction and leave everyone gasping, but if Laminar do announce something significant, then their aim is not towards you and me, but directly at those CEO FlightSim developers that are still sitting on the X-Plane fence.... so it is certainly going to be a very interesting FlightSim Conference this year in Vegas, if only for the Ben Supnic show, both on the stage and probably off it as well. X-PlaneReviews will of course bring you all the full highlights and details of the 2018 Expo as soon as they are available. I am going to bring up the point of internal detail in airport terminals... now I love detail, and the reflection of real world realism when you are at a scenery, and to me arriving or departing a scenery that reflects what I have felt and seen in real life is the ultimate deal here. But I really don't see the point of internal terminal detailing unless it is seen or is in partnership with the external details. There has however been some outstanding details like the excellent Cormac Shaw EICK - Cork, terminal and the excellent terminal building at Turbulent's MBS but the differences here are the huge glass walls that reflects in on the internal details, in this case it is that I am overwhelmingly in favor. But what about the rest. as glass is one of the really, really hard things to get right in X-Plane and in most cases it looks bland or even grey. But what I am seeing lately is a lot of wasted development time and far too much focus on these internal structures to the detrimental point that external areas are unfinished or not given the same extensive attention, and for what really? JustSim's UUWW - Moscow Vnukovo showed only what was actually required in day and night time terminal textures to make a terminal very realistic, and my point of view down on the ramp in turnaround is to me the most important aspect of realism, the main point here is that in most cases the idea and execution of internal detailing just don't match or live up to the real world same view point, in other words it looks like the model or modeling it is and not a realistic looking terminal building, but overall it is the wasted time for so little gain and in so much to the detriment of what they are actually trying to achieve with the scenery. May was all about scenery (again), and some in Turbulent Design's IDA - Idaho and MBS - Michigan were excellent, even if a few areas certainly highlighted the FlightSim approach more than the X-Plane Dynamic approach, but as scenery they are solid additions, I really liked KDAB - Daytona as well, but there was a few areas (mostlt buildings) that needed more realism and wear and tear. Certainly JustSim really delivered the scenery of the month with their excellent UUWW - Moscow Vnukovo as this is what most scenery is now supposed to deliver in price and quality, and major kudo's to JS for also providing the WT3 ground routes as well for instant activity. But with the very good, there was a lot of quite average if only freeware grade quality, the level in payware is now high, and even average scenery is just now not going to past the credit-card now no matter what the price, and again a lot of the scenery was released well before it was meeting the grade of even the basics, again X-PlaneReviews do filter it out, the best is noted here, but the sheer volume of releases lately means we can't cover them all in the release period, MBS by Turbulent is still coming and so are two Polish airports. Aircraft in May was focused on mostly GA and trainers, with my beloved Carenado Bonanza F33A getting the full XP11 treatment and the JustFlight/Thranda's release of their excellent C152 ll, both of which are exceptional. So a fair percentage of my flying this last month was in this GA size category. One longer route aircraft I flew in May was the veneable JRollon CRJ-200. There is no doubt the aircraft is really feeling it's age now, even for the ground-breaker it was on it's release, the heavy outdated textures do show and the system dynamics are now also feeling quite limited. But one thing it did show me was that the requirement to keep the aircraft up to it's current version status, I set it up early in the X-Plane11 release with that update, but when I flew the aircraft (from SLC to IDA) it was amazing at what didn't actually work with the later X-Plane11.20 version of the simulator, just small things, like a non-starting Engine 1 that drove me simply spastic in trying to depart, but with the only one engine starting and running, even when an X-Plane11 restart didn't fix it, I simply gave up... In my mind the aircraft was up to date, but actually it wasn't, there was a one added to the v1.40 to v1.41 that needed to be installed, and the excellent CRJ-200 BSS soundpack was also out of date( by a month). Both packages now installed and the CRJ-200 finally winged it's way to Idaho. The motto of this story is that even the smallest updates need to be covered to use any aircraft correctly in the simulator, even if it takes afternoons of your life away updating in doing so. I have covered the basics of the FlightFactor A320-214 Ultimate but not yet done a full on review of the aircraft. Is it still in beta or is it not? Well it is released but the continuing beta test pattern even with the sometimes daily or weekly updates still continues. I thought that I finally was in a position to give the FF Airbus A320 it's due, but then a full modelling update was released, this aspect is very rare as most released aircraft are very rarely changed from their initial 3d work, as to change this aspect later can also affect a lot other things and mostly the textures (liveries) aspect, but no the bus now had a new forward underside and reconfigured nose, no doubt the bus is now far more bussy, and the changes are excellent as are a few other areas that were touched up, this was no doubt for the hoards of comments on the shape of the bus's nose, but even I will admit it looks far, far better, but overall major adjustments like this are usually very rare, so that shows the commitment by FlightFactor to the aircraft. I liked the idea of the IAE V2500 engine option as most of my local Jetstar (JQ) A320's are powered by that engine variant, but overall for me with such an in depth simulation from this aircraft the different performance was or is as important as the visual aspect, hopefully FlightFactor will add in the IAE V2500 option soon in the future. It is certainly becoming a very in-depth A320 simulation, but as noted earlier, my hours on the aircraft this past month were very low, and I actually only flew one flight (EDDL - ENGM), but I have several if more planned for the next few weeks. The little time in the cockpit however didn't mean I was not still learning as much about the A320 as I can, through the real manuals, but mostly watching YouTube videos of real cockpit A320 flights, there is some good videos out there and some really appalling ones as well (why can't they just hold the camera still) but this month there popped up a great series of videos by Graham called Reflected Reality Simulations. The really brilliant thing about these series of videos is that you have a real world pilot, now flying the simulated version of the same FlightFactor A320 Ultimate as you fly. The detail uncovered here is well worth the time spent watching them (and making notes) to be transferred to your own flying skills in the airbus, it is very detailed, but Graham covers a lot of aspects you never even knew about in the various system functions and FMC settings and it is simply invaluable information in getting the full and immersive quality out of the simulation, this is real world information on how real pilots fly this machine, and as much as I have studied and learn't over the years in X-Plane this series takes you to a totally whole new level of engagement with your A320 flying, highly recommended. 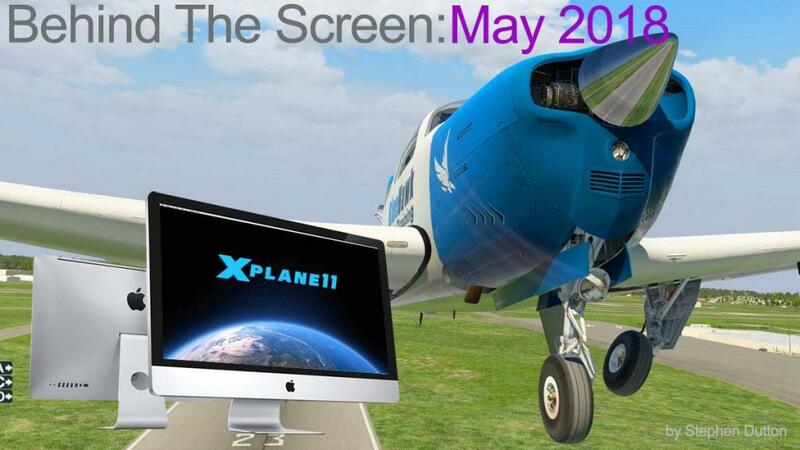 That was May, another big month in X-Plane simulation, as noted with the coming FlightSimExpo in June then certainly the coming month will be just as busy and full as the month just gone... So see you at the other end of the month and already the start of the second half of 2018.